WWF has been active in Central America for more than 20 years. Guatemala’s regional office directs projects throughout Central America with a focus on conserving the Mesoamerican Reef (MAR). 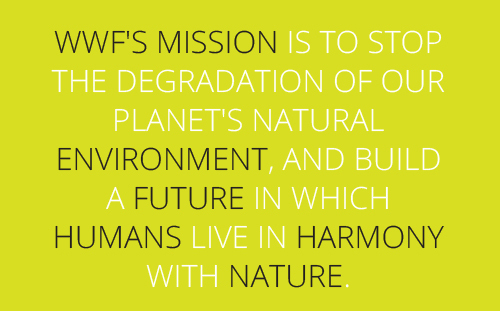 Our work supports WWF’s global mission to build a future in which humans live in harmony with nature. We tackle the greatest threats to biodiversity while improving the lives of vulnerable communities in order to minimize human’s footprint on the planet. WWF is the world’s leading conservation organization, working for more than 50 years to protect nature. We work in 100 countries and are supported by 5 million supporters globally. Protecting the earth’s web of life to build a secure and sustainable future. Reduce the negative impacts of human activity to nature and ensure natural resources are used sustainably and shared equitably. WWF Guatemala is tasked with conserving the Central American region’s unique biodiversity - including the world’s largest transboundary coral reef, the Mesoamerican Reef - while supporting the well being and economic development of these developing nations and their people. And the pressures are high. WWF’s 2014 Living Planet Report measured great losses of biodiversity for this region, with an average species loss of 83% across Latin America in the past 40 years. With high poverty rates, countries like Honduras, Guatemala and Belize are listed among the top “at risk” nations to climate effects globally. Facing these challenges head-on WWF Guatemala works to find and test practical solutions that promote conservation and sustainable development and can be replicated throughout the world.